•	DRESS CODE: Please remember: 1) no leggings or tights may be worn unless they are worn beneath dresses, skirts, skorts, shorts or culottes, 2) excessive wear is not allowed, and 3) no skin nor any undergarments may show. Please keep jeans with excessive wear/excessive fraying for weekend wear. 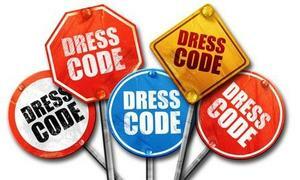 The district dress code guidelines is available on our website for you to review.